The BMW i3 has been around for a good number of years, and is representative of BMW’s idea of sustainable mobility. Powered by electricity, built on a specially designed platform, and featuring plenty of renewable materials – all of which are rather costly decisions – it would appear that the i3 was built to prove a point for the company more than anything else. While initial uptake of the i3 was a little slow in beginning, with less than 1,500 units being shifted globally in 2013, the all-electric city car slowly became commonplace, with over 100,000 units delivered within five years of its introduction. In all that time, and until now, the i3 has only ever been built in one place and one place only – BMW’s Leipzig plant, which is one of the world’s most sustainable car manufacturing plants. In 2017, BMW decided that it wasn’t done with the i3, and decided to bless it with a higher-capacity battery and a full facelift shortly after. The latter also saw the introduction of something that is utterly bewildering to this writer: a performance version called the i3s, which comes with more power and sportier styling. To make sense of this decision, we had the opportunity to try one out during our time in Portugal, in conjunction with the international media launch of the latest F90 BMW M5. With a main event in the form of the quintessential sports sedan, can the sideshow that is the i3s still be able deliver a memorable time behind the wheel? In terms of numbers, things aren’t off to a good start. 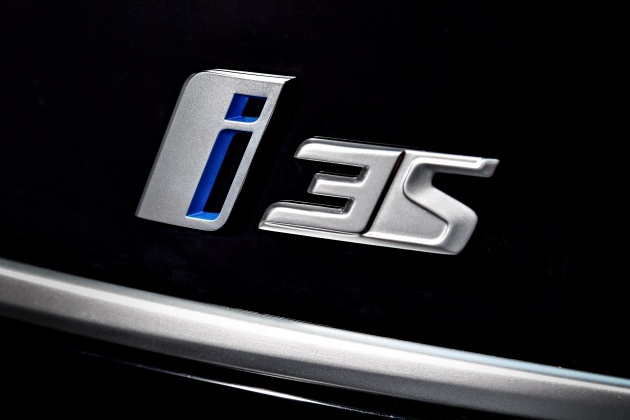 The i3s we drove packed a 33.2 kWh (output)/94 Ah (capacity) lithium-ion battery, which supplies power to a rear-mounted hybrid synchronous electric motor with integrated power electronics, charging unit, as well as generator function for energy recuperation. Said electric motor is rated at 181 hp (135 kW) and 270 Nm of torque, which is more than the regular 94 Ah i3 that my colleague Anthony tried out previously. 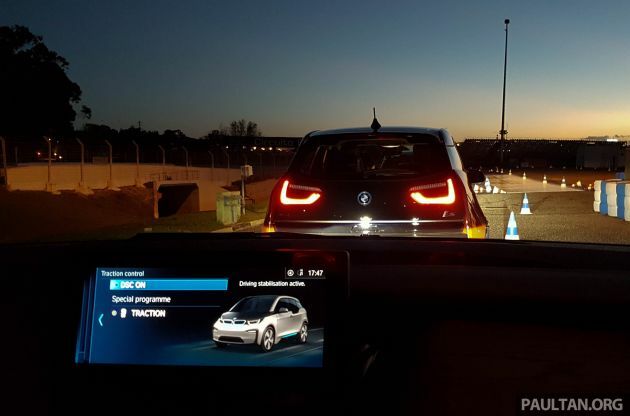 The gain of 14 hp (10 kW) and 20 Nm is largely due to a modified motor control, which helps with the zero to 100 km/h sprint time of just 6.9 seconds, which is 0.4 seconds faster than the 94 Ah i3. More importantly, these enhancements, along with new taper roller bearings, result in a different power deployment strategy evident by the i3s’ performance curve that no longer nosedives after peaking like on the normal i3. Instead, power is now spread across a wider band at higher “engine speeds,” meaning the i3s will continue to pull where a standard i3s would normally feel a little out of puff. This was most evident during our drive when attempting to accelerate further at higher speeds, like say from 80 to 120 km/h, as the i3s would just take off with little hesitation, maxing out at 160 km/h. Referencing BMW’s official figures, the i3s is said to complete the feat in 4.3 seconds, almost a second quicker than the i3, confirming our suspicions. While the figures may not that exciting for those attuned to what Tesla offers, the sensation of using what’s provided is nothing short of addictive. The instant torque delivered by the e-motor driving the rear wheels is a rather unique feeling, and is enough to pin you to your seat with some force during hard accelerations from a rest. Once we were done fooling around, the i3s is perfectly capable of settling down for the humdrum city driving style when needed. 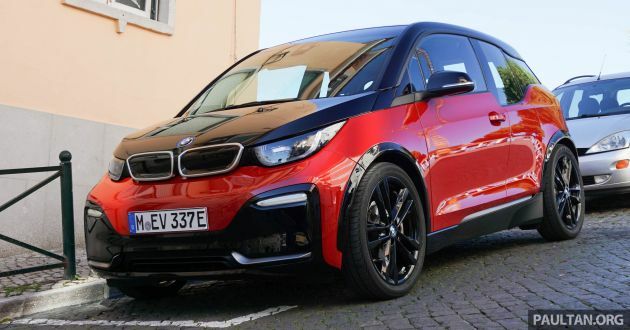 In fact, I would be willing to say that it doesn’t feel that much different from a run-of-the-mill i3 when you discount its amplified acceleration capabilities, which won us quite a few traffic light “drag races” against curious motorists. Put simply, it never feels like the car is constantly urging you to let it off its leash. Of course, the looks are counterintuitive to this, as the i3s packs more aggressive front and rear bumpers to distinguish it from its lesser-powered sibling. These are complemented by gloss black accents on the front apron and grille, as well as gloss black fender extensions that mask a 40 mm wider track. Our drive in the i3s wasn’t a particularly long one, as the roughly 45-km route assigned to us took us from the Lisbon Portela Airport to a lookout point near the Nossa Senhora do Monte chapel in the city commons. From there, we would head to the Time Out Market near the outer fringes of the city, and on to the beachside Pedra do Sal Environmental Centre (CIAPS in the Portuguese acronym) before ending up at the Estoril Circuit for a closed-course experience. On the primarily smooth roads outside the city centre, the i3s was largely fuss free, delivering a comfortable ride throughout. The only intrusion that we noticed was the road noise that came from the low rolling resistance Bridgestone Ecopia tyres, which are still staggered like on the i3, but with a larger profile. It’s a different story when driving into the city centre, where pothole-ridden and cobbled roads were more prevalent. In such cases, the i3s’ had a harder time dealing with the uneven surface, resulting in quite a bit of body swaying for passengers than most would enjoy. The i3 was already quite agile, but BMW saw it fit to equip the i3s with specially developed springs, dampers and anti-roll bars, along with a 10 mm lower ride height. While these sound ideal for improving driving dynamics, I don’t think many will be chasing lap times within a city, so the stiff ride that results from these tweaks are a little undesirable in my books. Be that as it may, the i3s’ compact footprint, quick (but rather lacking in feel) steering, surprisingly tight turning circle, and excellent all-around visibility made it excel on the narrow roads within Lisbon. The heightened seating position – a result of the battery’s placement – helps with visual coverage, ensuring we kept clear off the low kerbs on our travel. In terms of getting around, the i3s does well as a city car, and it also packs a rather warm and inviting interior. A variety of environmentally-friendly methods to craft the cabin, from the leather that is tanned using natural extract of olive leaves, to the use of kenaf fibre in place of petroleum-based plastics. Even the fabrics used fabric used are made from 100% recycled polyester, 34% of which is sourced from PET bottles, while FSC-certified plantation supply the eucalyptus wood used on the top dash. The use of eucalyptus is due to its property of being naturally resistant to moisture, therefore requiring about 90% less surface processing than conventional wood. All these components are presented in an eye-pleasing fashion that has a rather Scandinavian feel to things. There’s also an air of simplicity to the interior, with a no-frills, 5.7-inch digital instrument cluster display in front of the driver and a basic air-conditioning system. You still get the iDrive system and accompanying interface methods, but the two-spoke steering wheel and distinct gear lever near it are reminders that this isn’t your typical BMW interior. Keep in mind that there are some compromises when it comes to practicality. Firstly, while the i3s offers seating for four, those in the rear will have to navigate a rather narrow ingress through the rear suicide doors. Upon getting in, they’ll also have to deal with a stadium-like seating setup due to the drivetrain’s location in the rear. To ensure there’s sufficient headroom, the ceiling features concave sections, which helped accommodate my 170-cm size sufficiently, as the photo below shows. For even taller passengers, I can’t guarantee you’ll not have to tilt your neck a little. On a related note, the boot has a rather high floor to make room for the drive unit, and the base 260 litres is enough to swallow up the usual grocery run. Upon our arrival at the Estoril Circuit, the i3s’ handling improvements begin to justify themselves. On the prepared course, the pint-sized EV is a hoot to chuck around, displaying good composure, agility and tractability be it through slaloms, sharp hairpins or quick lane changes. Just like on the i3, the basis of the i3s is the BMW i LifeDrive architecture, where the first part of the name (Life) references the body made of carbon fibre reinforced plastic (CFRP). Meanwhile, the Drive module is made entirely out of aluminium, and is what the floor-mounted batteries and rear-mounted drivetrain are mounted to. This helps provide a lower centre of gravity, and with the wider tyres (175/55 front and 195/50 rear) wrapped around 20-inch wheels, keeps the i3s rather planted despite its awkward shape and unladen weight of around 1.3 tonnes. Unfortunately, as the surface was mostly dry during our runs, there wasn’t much slipping and sliding to be had. We did try to force the issue by giving a boot full of throttle when trying to navigate around hairpins, which was enough to unstick the tyres somewhat before the system stepped in to restore order. By the end of the day’s activities, the i3s still managed to hold quite a bit of charge – about 100 km of range according to the digital instrument display – despite the lack of regard we had when it came to conserving range. BMW says the i3s will provide up to 245 km of range following the WLTP in Comfort mode, which I believe is enough for daily use and a sufficient range anxiety deterrent. Recharging the battery can be done while driving via regenerative braking (up to 50 kW), which can be called upon more actively when the car is in Eco Pro mode. With a combination of virtuous pedal operation and regenerative braking, it’s possible to drive with just one-pedal, although the effect of the latter isn’t as profound like what you’d get with say, a Nissan Leaf. A more effective means of charging is with the i3s’ Combined Charging System connector, which is an extension of the Type 2 connector. The i3s packs an 11-kw onboard AC charger, and when plugged into a 3.7 kW wallbox, will take about seven and a half hours to achieve an 80% state of charge. Alternatively, a higher output 7.4 kW unit will divide that time by half, while the full-fat 11 kW, three-phase wallbox is the quickest at two hours and 45 minutes. The two large direct current pins below are for DC charging, and with a 50 kW charger, it’ll take about 39 minutes to achieve an 80% charge state. In selected locations in Malaysia, you’ll technically be able to plug the i3s to a BMW i Wallbox Plus, which features scalable outputs, from 10 to 32A – at 230V single phase (7.4 kW) up to three phase 22 kW. Alternatively, there are also other public charging stations set up by ChargEV and ABB, which offer AC and DC charging solutions for your vehicle. Going back to the earlier question posed, the i3s no doubt delivered a memorable driving experience, and I urge you to try one if you have the chance to do so. It may seem strange that BMW even bothered to make a performance version of the i3, but I do see a bit of rationale to their decision. Sustainable mobility is not exactly a term that draws in the crowds, but the i3s is BMW’s way of proving its point that committing to it doesn’t necessarily mean you will be condemned to a life of joyless hypermiling. And when it comes to having some good, clean, Earth-friendly, honest fun, the i3s delivers on those fronts. Hey, if that’s not enough for you, the i3s is one of the very few compacts BMWs that is still rear-wheel drive, which you can’t say for the upcoming 1 Series, among others. 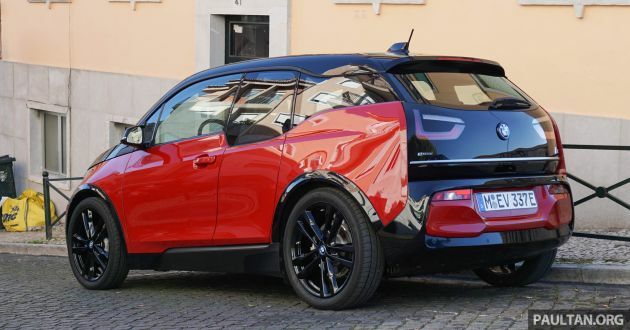 Since our time in Portugal, BMW has introduced a 42.2 kWh/120 Ah version of the i3 with up to 310 km (WLTP) since we drove the 94 ah, but the range extender option is no longer available (at least in Europe). The BMW i3s has since been launched in Malaysia at an estimated price tag of RM279,000. Too bad BMW didn’t take their i concept farther ahead. Now Chinese EV cars are rapidly catching up while BMW still ponder what to do with EV. I hope this car don’t sell here like i8 prices. i8 was RM1.45 million. BMW Malaysia pls be reasonable! What u talking about? BMW i is now at the core of BMW’s business with every model rolling out with an iPerformance model and soon BMW M will have some i DNA in it. They have sold more i3 models than all the Chinese EV combined sales put together since here in the States and Europe they are fast adopting it as a family car. Too advanced for Bolehland….don’t bring here.